For non-contact temperature measurement and monitoring of temperature processes in Ex-hazardous areas. The intrinsically-safe non-contact temperature measuring equipment Ex-MP4 a is a robust yet exceedingly handy and easy to use instrument for temperature measuring in ex-hazardous areas. Response time - fast and accurate. Pyrometers respond to emitted energy and are around 20 to 1000 times quicker than traditional direct contact thermometers. Low maintenance and non invasive - the temperature of the object being measured is not affected by the procedure. Hard to reach objects and moving materials - the optics of the pyrometer are aimed at the object to be measured and with the laser sighting it is possible for both small and distant objects to be targeted. 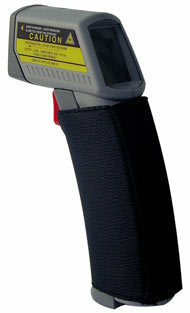 Hazardous and aggresive materials can be safely measured - and without fear of damaging the equipment. The compact size of the pyrometer allows it to be used in even the most awkward positions, with only a clear line of sight to the target area being required. With direct contact measurement, poor heat conduction or heat capacity of the object can prevent insufficient heat flow to a measuring device.